Played well, no other musical instrument sounds quite so pleasing as the accordion. While it may sound to some much like a miniature church organ, its mellifluous tone can cover seven octaves and can be shaped to suit classical, jazz and traditional folk. Musicfest Vancouver has recognized its importance this year, by dedicating a whole day to concerts featuring the accordion. Renée Bekkers and Pieternel Berkers, both in their mid-twenties, are virtuoso accordionists that form TOEAC a classical accordion duo from Holland. They play identical instruments (the Pigini convertor) but hardly ever in unison. Pieternel (the blonde) might look after the melody lines while Renée (who has auburn hair) might handle the detailed cadence. The twosome started with the rhythmically regular Stravinsky Tango. Originally composed for the piano in four-bar phrases, the girls give the piece an unusual Parisienne feel. This was followed by the first of two compositions by former rock musician Jacob ter Veldhuis. Views from a Dutch Train was inspired by the primarily flat Dutch landscape and written in his typically minimalist style. Ms Bekkers, who introduced the piece, described the arrangement as if she would be looking out of one window while her partner looked out of the opposite window. A pleasant surprise was the curiously titled History of the Seven Feathers (it wasn’t even mentioned in the programme). 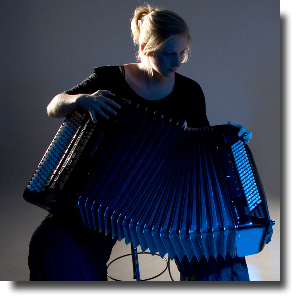 Adapted from a children’s story, the accordions impersonate the sounds of farmyard animals. One of the most interesting transpositions was the Holberg Suite, written Edvard Grieg and arranged for dual accordions by Toeac who chose to play only the final three movements. With the Gavotte we hear the strains of what sounds like a folk-song. The Air that follows Ms Berkers gives emphasis to the lower register, while in the concluding Rigaudon Ms Bekkers’ instrument brings a peasant quality. For the final selection, the second by ter Veldhuis, the girls changed from conservative black to colourful Gym kit. Body of Your Dreams is a sardonic take on marketing the fitness obsession. Two accordions are accompanied by spoken word sampling from an American television commercial for AbTronic ProTM – apparently some kind of abdominal exercise apparatus that induces 300 muscle contractions per minute – no one is really sure if the product is still available.